HOLY FREAKIN’ MOLY, peeps! HERE IT IS! OMG did you even think December would roll around again and we’d throw ourselves into the fray like crazed mud wrestlers at a four-by-four derby? Obviously, you misjudged us. BECAUSE OF COURSE WE’RE GOING TO DO THAT! 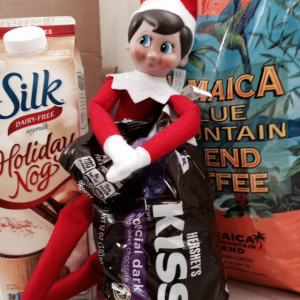 Tucker the merry elf is bringing in supplies for the festivities. WELCOME to the 2014 oh, no they di’n’t Hootenanny at Women and Words! Before we give you all the particulars n’ all of that, BIG SHOUT-OUT to all the authors and publishers who agreed to enable our yearly madness by graciously and generously putting books up for the holiday goodness and cheer. We could not do this event without you, and we hope you realize how much fun and luuuuuv you manage to share through this here nutso crazy time blow-the-roof-off-everything giveaway. Because you do. Thank you so much.